These are "bending" gongs. The pitches are ascending and descending and create a dramatic effect. They were/are used in Chinese Opera and now often in avant garde and more experimental musical situations. 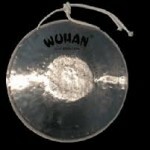 The 9" Wuhan Opera Gong we have found to be the most requested due to the responsive bending pitch A beater is included. 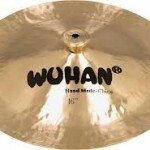 Wuhan China Cymbals are the real thing! These are authentic China cymbals hand made in China. They are trashy, dark and explosive. Originally made for marching bands, they became popular in the 30's when drum set players starting using them for special effects. They are now used in every style and continue to grow in popularity. 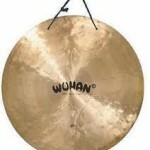 Often played upside down for riding as well as crashing, they are a true effect cymbal. Listed below are the most popular sizes. 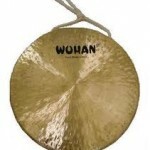 We have found the Wuhan Pasi Gong to be a very popular low pitched gong for all around use. The lipped edge on the gong creates an immediate response and long sustain. Hand made in China, it is often used for Broadway shows and small ensembles. They are a great meditation gong and small and light enough for transport. Often played hand-held, we recommend the 15" size. A beater is included. 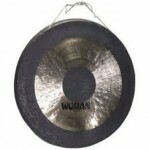 Wuhan Gong Stands are heavy-duty metal and easy to set up. They breakdown easily and are rectangular shaped. The basic stand shown at left comes in two models: One fits gongs up to 26 inches, the other up to 40-inch gongs. 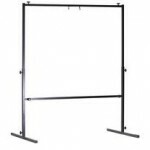 For extra heavy gongs, there is a sturdy and reasonably priced chrome stand with locking wheels which moves effortlessly and fits up to forty-inch gongs, shown below. These Wuhan Wind Gongs are flat shaped and made of hand hammered brass. They have a very full sound and quick response. Because of their light weight they are easy to transport. They are great for small ensembles. A beater is included with each gong. The most popular sizes are the 22" and 28". Made in China for centuries, the Wuhan Chau Gongs have been favorites of international symphonies for years. They are hand-hammered in a one- piece cast and have a low resonance not found in many other gongs. They are adaptable to many musical situations and create an impressive effect. They are heavy and a stand (sold separately) would be recommended. A beater is included. Sizes listed are the most popular.